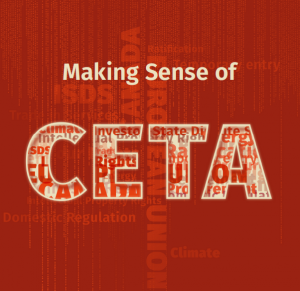 New report: Making Sense of CETA available now! The report is available free of charge here. “The ratification of CETA would be a severe setback for efforts to encourage non-industrial farming practices and sustainable agriculture on both sides of the Atlantic and for fair prices for producers instead of dumping export prices“, stresses Berit Thomsen, trade policy officer at AbL. “CETA will undermine sustainable energy and climate policy in the future. Efforts to stop fossil fuel-based energy production and promote renewable energy will the threatened by CETA, which poses an immense danger to any measures put in place to reach the goals that the EU and Canada agreed to in the 2015 Paris Agreement”, trade policy expert at BUND Ernst-Christoph Stolper explaines. The publishing organizations call for an immediate halt of the CETA negotiations and the ratification process.